Succulenta (Netherlands) xlix. 125 (1970). Origin and Habitat: Frailea perumbilicata has a relatively small range in Rio Grande do Sul (Brazil) and Concepción departments in Uruguay. Habitat: In Brazil it grows on grass plains, elsewhere mostly on rocky outcrops and stony fields. Frailea perumbilicata is not abundant and its distribution is sparse. In general, Frailea species have a relatively short lifespan but rapid reproduction (generation length is 3-5 years). The major threats are trampling by grazing cattle, agriculture, forestry (Eucalyptus plantations), and fire. 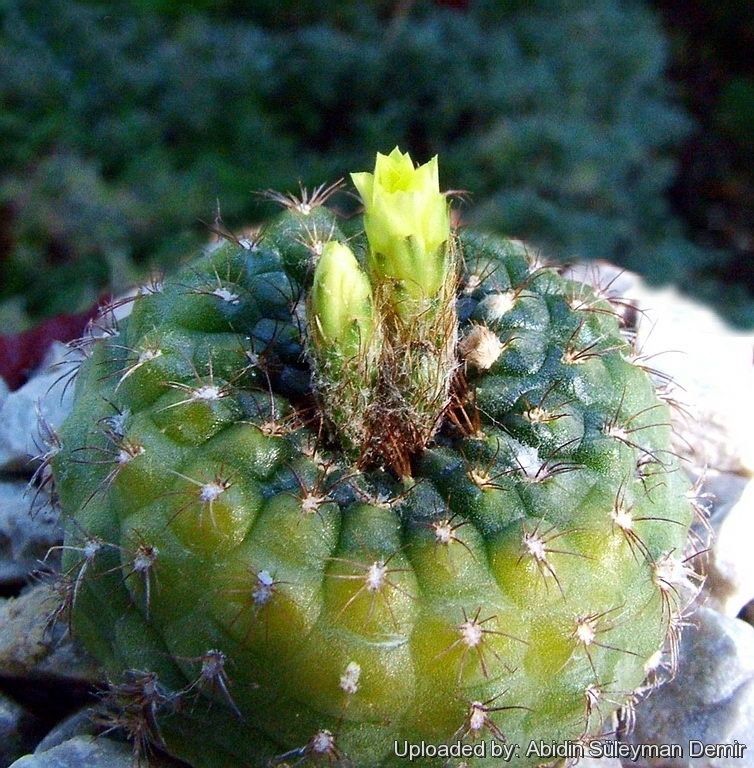 Description: Frailea perumbilicata is a tiny solitary cactus with globular stems typically flattened and umbilicate above, (wider than taller). Frailea perumbilicata is considered by many a synonym of Frailea schilinzkyana. This two taxa are linked one to each other by plants with intermediate characteristics and shows similar features, namely size and form of stems, radial spines, flowers, fruit, etc., prove, that is impossible to differentiate between these taxa. Habit: Frailea perumbilicata is a very small cactus that remains solitary or (occasiaonally) somewhat cespitose. Stem: It is diminutive in size, 2-3 cm high and in diameter, depressed globular and somewhat flattened and umbilicate above, (wider than taller). Dull yellowish-green, green or olive green. Ribs: Usually 15, divided into rounded tubercles. Radial spines: About 6 to 10 needle-like, twisted, spreading, more or less appressed and reflexed 2-3 mm long tannish-brow in colour. Central spines: Usually absent, occasionally one stouter than the radials.